This year it seems like I have a class of reluctant readers. Being the reader that I am, this makes me sad so I'm determined to turn it around by the end of the year. The first thing I need to tackle though is getting them to read. During our first week of school, I noticed many students choosing inappropriate books for their reading level and then flipping through the books, skipping pages, reading a page and going to my library to switch the book (then spending all their reading time there), and doing anything to pretty much avoid reading. By the end of the week, we had completed a reading assessment so I had a pretty good idea of a reading range for each student. My library books are AR colored coded from a previous school where I taught that used AR, so I assigned a color to each student. They were then told to pick a chapter book that they were going to read from beginning to end. Friday, we were definitely progressing as they all had a book in their reading level and had stopped running to the classroom library every two minutes. This week my goal is to hold them accountable for reading. 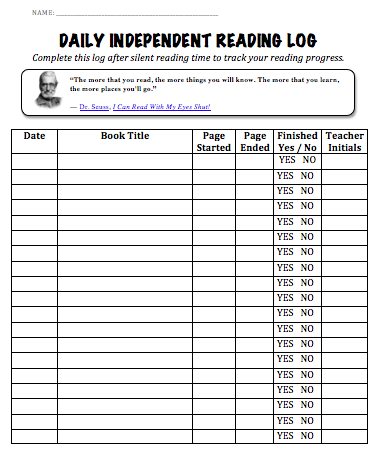 I created a reading log where students can track their book, pages read, and note if they finished it or not. I also added a place for my initials to hold me accountable for checking in on them! My first thought was to have them complete a reading response page where they respond to reading, but as reluctant readers I worry that may turn them off of reading more if they feel they need to respond in writing to everything they read. I'm going to keep this idea in the back of my head and perhaps incorporate some way in the future. My next step is looking for reading incentives for my class. I like these brag tags and the way Confessions of a Homeschool used them. I was thinking perhaps I could have different prizes (stickers, pencils, certificates, candy) based on the number of books read, but then I have a range of reading levels in my classroom so one could be reading Harry Potter that is going to take much longer than another reading Junie B. Jones. I know many track minutes, but every student would be reading pretty much the same minutes in the classroom as we all have silent reading time at the same time. Another idea was to perhaps "catch them reading" and they receive something then. Things to ponder! Do you have independent reading time in your classroom? If so, do you have students track their reading? Do you use a reading incentive program?